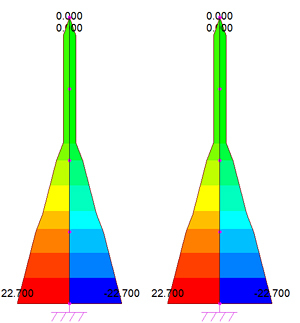 How are the interaction curves for column verification used according to Eurocode 2? 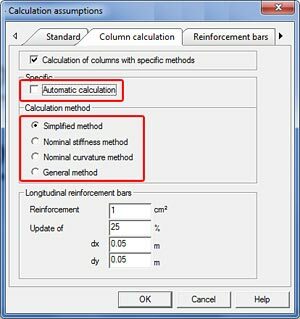 In this FAQ the user will learn how to verify a reinforced concrete column section using the interaction curves. A simple column with a cross section of 60x60cm and height of 4.00m will be subjected to combined bending and compression from axial forces. First, the user must define the combinations for the concrete calculation. This is very important as values of forces from combinations for ULS and SLS are used for calculating different ratios. The interaction curves are used for manual verification of the internal calculation of required reinforcements, which uses a step-by-step algorithm. 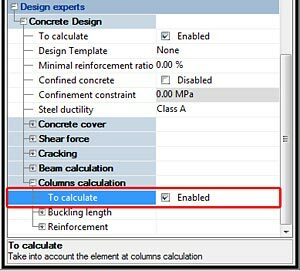 To access the interaction curves, the user must first activate the "To calculate" option in "Columns calculation" in "Design experts" and define all the characteristics regarding the calculation of the element to dimension: concrete cover, steel ductility, etc. Next, the method used for reinforcement dimensioning must be selected. Options available in this window will affect the final results. The command can be accessed from Assumptions - Reinforced concrete design - Calculation assumptions. The user can keep the default option, "Automatic calculation", or select the appropriate method. Automatic calculation - The program will use the "Simplified method" if the element is subjected only to axial loads and if the element is subjected to axial load and bending moment, "Nominal stiffness method" is used. 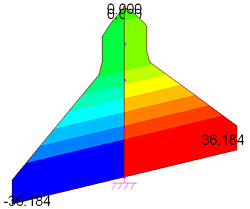 General method - The program will calculate the most unfavorable values of design moment of the applied internal bending moment calculated with nominal stiffness and nominal curvature methods. For this example, the default "Automatic calculation" will be used. Run the finite element and reinforced concrete calculation analysis and display the calculated (theoretical) required area of reinforcement. Because of the symmetry, the areas of required reinforcements in both directions are equal. 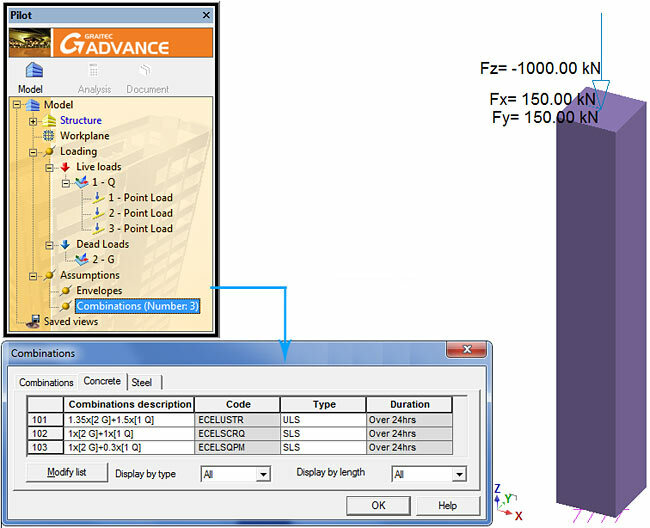 OBSERVATION: Advance Design will compare the calculated areas with the maximum percentage area imposed by design codes. 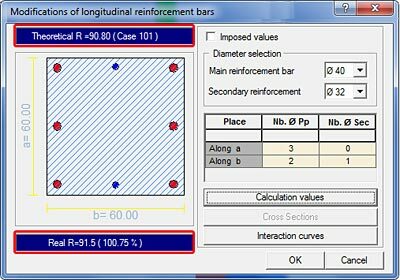 There are cases when the required area of reinforcement is larger than the maximum percentage of reinforcement allowed, in which case Advance Design will limit the displayed values to the maximum percentage. The diagram will look like the following figure. 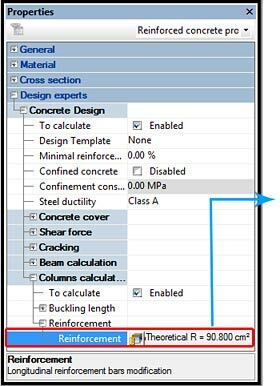 Select the element, and in the properties window, under "Columns calculation - Reinforcement" select "Reinforcement" and click the button to open the "Modifications of longitudinal reinforcement bars" window. In this window, the user can add or remove longitudinal bars along the section sides. The theoretical reinforcement area is displayed at the top of the section and the real reinforcement area is displayed at the bottom. This is the value verified with the interaction curves. 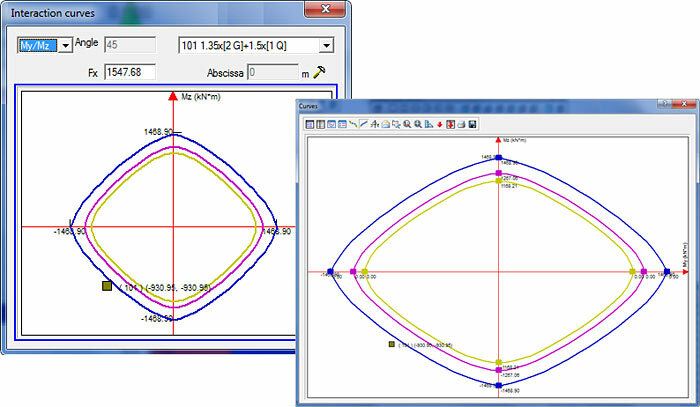 Advance Design will automatically place on the section reinforcement bars, taking into consideration only the calculated theoretical area and disregarding symmetry (see current example). Edit the main and secondary (if any) reinforcement diameters and place the number of bars in each direction. After the placement of reinforcement bars, click "Interaction curves". This will open the results of section's capacity. Double clicking on the drawing area will enlarge the results and provide the possibility to zoom and display extreme values. With this particular example we can see the necessity of verifications with interaction curves. Even though internally, Advance Design calculated a theoretical required reinforcement area, using interaction curves the verification failed, meaning that a much larger real reinforcement area is needed.